Living in the beautiful mountains of SoCal means that I get snow during winter. Balancing being a single parent with a full-time job means I take every little ride opportunity I get and am DAMN happy about it!! 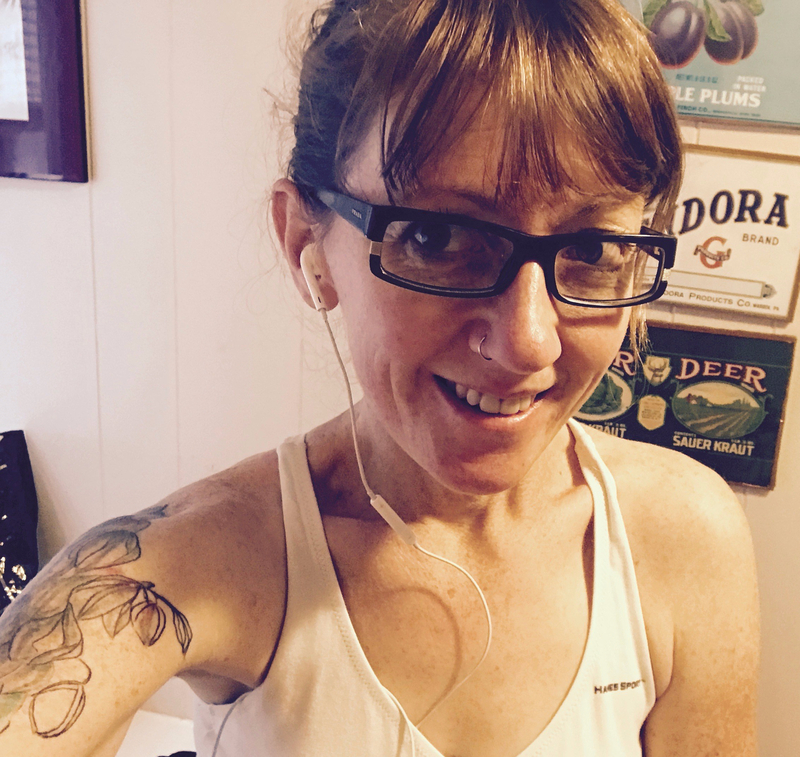 Craig recently got me into a new training tool: Sufferfest. While the commentary is a little funny at times, it has given me a great routine during the winter. 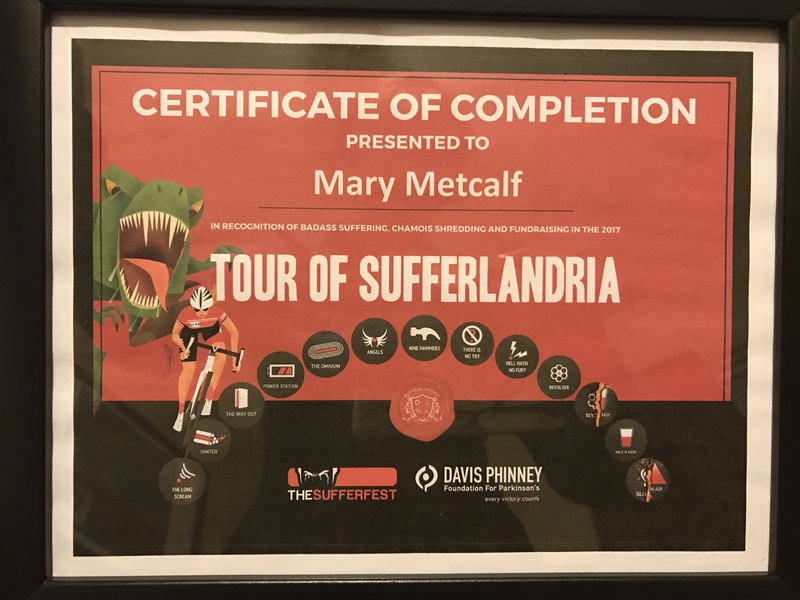 We got through the Tour de Sufferlandria together in February and it was the kickstart to 2017 that I needed. Just before the tour started Craig’s roommate asked me, “I hear you’re gonna ride some of the tour?” SOME?!?! Oh, I’m doing all 9 stages! 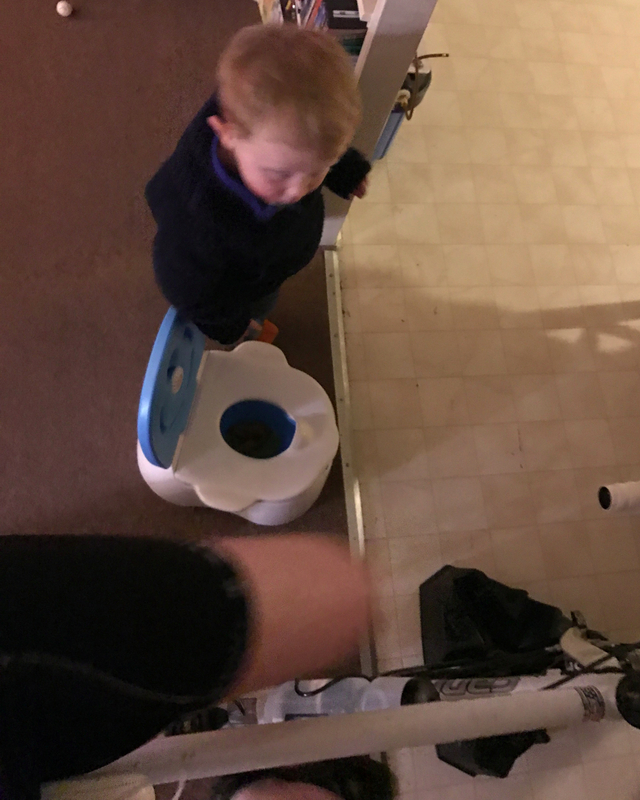 Difficult balance of training WHILE potty training! The boys would run in place when my routine picked up! The tour is 9 DAYS ON THE TRAINER with riders around the globe. I know I’ve professed to many that if it isn’t outside and beautiful, I won’t do it. Well, I lied. I somehow carved out the time to get on the trainer for nine days straight, totaling about 12 1/2 hours. The workouts were almost all about strength and I finished the tour proud that I did it and feeling very strong on the bike. Balancing that time with kids wasn’t easy but my boys were very understanding. 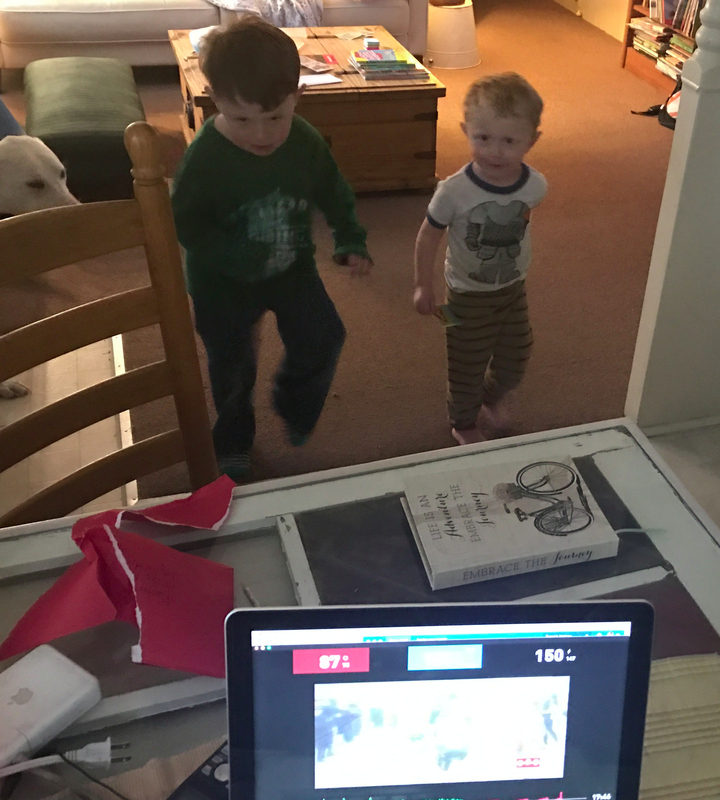 They even joined in at times, running with me or bringing the potty in to show me their latest accomplishments in training. Next up – The Wild West Stagecoach Century. Keep in mind, I’m a mountain biker and this is a road time trial with time cutoffs. My goal was to just finish within the time cutoffs and get myself some base miles. At the start, I got all suited up in the bathroom and put my shoes on…um… my mountain bike shoes. Oh goodness! We had to drive 3 hours for this race and I brought highly incompatible shoes for my road bike… I mean, you can’t even bolt on Look cleats to mountain bike shoes so I couldn’t just snag up some cleats from Paul, the Velofix guy there. After much head scratching, we decided we’d tape my mtb shoes to my road pedals and I’d roll up to Craig if I needed to stop… Seriously!! He was getting out his duct tape when we realized that Paul had flat pedals with cages. That’ll do! When we started riding – pretty darn late thanks to the pedal debacle and head-scratching time – I felt like a butterfly! I mean, my road bike is so light and responsive compared to any mountain bike. I had come out of the tour with more strength than I’ve had in years and what a great feeling. The first 50 miles wasn’t bad at all, since climbing is my thing and I was fresh and strong. I only have a double and on some of those climbs, I just stood and chomped it up. The crazy part is that the second 50 is primarily downhill, but I can’t remember the last time I rode 100 miles on my road bike! It’s been far too many years. The exciting roads of the Stagecoach Century – perfect weather! Flat pedals are sure better than duct tape. Stagecoach Century 2017 in the books! I’m just remembering how to fuel for 100 miles and starting to stock up on all my essentials, but let’s just say that I wasn’t well prepared. I didn’t have the proper fuel or recovery during the ride and that responsive road bike; it was beating the hell out of me on these rural bumpy roads! My upper body grew so tense and every bump was killing my arms and neck. I’ve been through this before when racing 24 hour races, and there’s not much you can do en route other than ibuprofen. I’ve slowly been stocking up on b-vitamins, Perpetuem, and Endurolytes and it’s time for a bike fitting on my road bike! This is the performance curve of getting back into real training and racing. We came in just over 8 hours (moving time was only 6:40 though! 🙂 ) For a flat desert race, the almost 5k of climbing kinda sneaks up on you. Oh and the flat pedals… worked great!